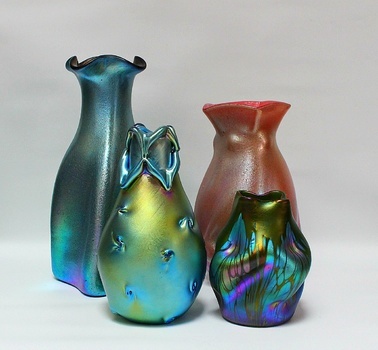 In Art Glass > American Art Glass > Show & Tell and Art Glass > Bohemian Art Glass > Show & Tell. I think it is possible that the art glass neophyte might have a hard time distinguishing, in this picture, glass that was produce in early part of the 1900’s from glass that was produced in the 1970’s. I love this contrast of new and old. All beautiful pieces Mac! The one that impressed me the most is the Orient and Flume as I've never seen one so beautiful! Excellent pic too!